OK people. In the past, I posted a recipe for salted chocolate chunk cookies that are firm on the edges with a soft interior. They are the bomb. But these? These are, as my husband says, “ the best cookies I’ve had in 69 ½ years.” And I wholeheartedly agree, even though I am a year younger and a much more sophisticated cookie taster. Preheat the oven to 300 convection degrees. Line two baking sheets with parchment. Sift together the flour, baking soda, and salt. In a mixer fitted with a paddle, mix the butter, sugars and corn syrup for about three minutes. Stir in the vanilla, then the milk. Add the flour mixture all at once and blend just until a dough forms. Fold in the chocolate and walnuts. Chill the dough for at least an hour. Roll 1 ½ tablespoon lumps of dough into balls, then place on the baking sheet and flatten to 1/4 inch-thick disks spaced two inches apart. Chill the dough between batches. Bake until the edges are dark golden brown, 17 minutes. Let cool slightly on the baking sheet, then transfer to a baking rack. I do one cookie sheet, mid-oven at a time. 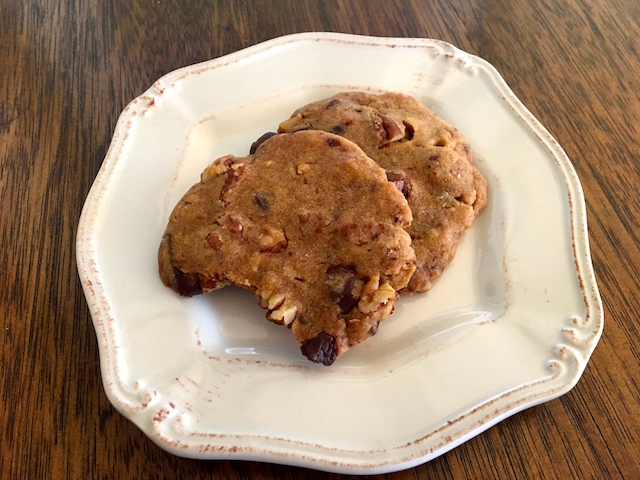 This entry was posted in Cookies and tagged chocolate chunk cookies. Bookmark the permalink.